We serve the telemedicine and ehealth learning needs of rural and medically underserved regions. We provide educational programs to patient sites and train practitioners about telehealth and health care delivery innovations. We provide a dynamic learning environment where practitioners, administrators, managers, and telemedicine coordinators develop the skills and knowledge needed to enhance the quality of tele-health care in their communities. 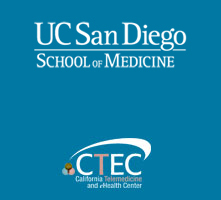 The Learning Center brings together world class educational resources: The UCSD School of Medicine, UCSD Healthcare, CTEC, the VA San Diego Healthcare System, and Calit2. Telemedicine electronically transports medical care into the most remote areas. Persons who live hours from medical care can directly access high quality medical expertise without leaving their communities. The concept of telemedicine seems simple enough — the practice of medicine over distance via telecommunications ... however, the implementation and practical use can be complex. Telemedicine is an invaluable resource to help address a variety of health care needs. Telecommunications and information technology have the power to overcome many disparities in healthcare — we tap into their potential and find creative and practical solutions. Today, telemedicine connects physicians many miles away through high quality visual and interactive state-of-the-art technology.